Visual AIDS has commissioned seven artists— Mykki Blanco, Cheryl Dunye, Reina Gosset, Thomas Allen Harris, Kia Labeija, Tiona McClodden and Brontez Purnell–to create short videos ~7 minutes each in length about the ongoing HIV/AIDS crisis.The video program, titled ALTERNATE ENDINGS, RADICAL BEGINNINGS, is the 28th iteration of Visual AIDS’ longstanding Day With(out) Art project. Rosewood will be screening this film on Friday, December 1 throughout the day. This event was held Saturday, September 30 from 10am - 2pm at Rosewood Arts Centre. Join us for Rosewood's Clay Fest: A Celebration of Clay! This event is part of our yearlong celebration of ceramic arts, Set in Stoneware: A Year of Clay. POTTERY GAME COMPETITION! $50 PRIZES! All are welcome to participate; first come, first serve for entry into the competition. Each game is timed at 10 minutes! Observe, participate and appreciate the world of ceramics at Rosewood! The City of Kettering and Rosewood Arts Centre are pleased to present a special artist lecture and workshop with world-renowned ceramicist Beth Cavener. In partnership with the Akron Art Museum, Rosewood will host a workshop at Rosewood Arts Centre from Friday, April 28 – Sunday, April 30. Cavener of Helena, Montana, is a leader in monumental contemporary ceramic sculpture. Her work is characterized by animals in movement, often depicted in tense and emotional moments. Registration for Cavener’s artist demonstration at Rosewood is $145 per person, and includes a continental breakfast on all three days. Educational rates for groups of 5 or more are $100 per person. Advanced registration is required and can be done online or call Rosewood Arts Centre at (937) 296-0294. Spend a day admiring fantastical worlds, remarkable techniques and contemporary perspective! 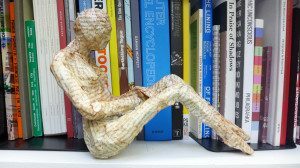 Rosewood Arts Centre will lead a one-day visit to Akron for the exhibition Turn the Page: The First Ten Years of Hi-Fructose, an artist talk by world-renowned Beth Cavener, and more! Turn the Page highlights over 50 contemporary artists featured in the pages of the art magazine Hi-Fructose. From highly detailed paintings to expressive sculptures, Turn the Page is a must for anyone interested in representational, contemporary art. Exhibition artist Beth Cavener will present an artist talk on her dynamic, nature-inspired ceramics. Guests will also have the chance to explore the museum and the neighboring Summit Artspace, before a group dinner. Register for the trip. $110 fee includes transportation between Rosewood Arts Centre and the Akron Art Museum, a boxed lunch, museum admission, an artist talk and a curator-led tour. More information about the exhibition can be found at akronartmuseum dot org. Rosewood Arts Centre is proud to host screenings of COMPULSIVE PRACTICE for the 2016 Day With(out) Art, presented by Visual AIDS. This 60 minute video compilation features nine artists who live with their cameras as one way to manage, reflect upon, and change how they are deeply affected by HIV/AIDS. COMPULSIVE PRACTICE is curated by Jean Carlomusto, Alexandra Juhasz, and Hugh Ryan. 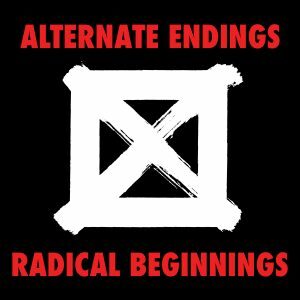 Participating video makers and artists include James Wentzy, Nelson Sullivan (1948–1989), Ray Navarro (1964–1990), Carol Leigh aka Scarlot Harlot, Juanita Mohammed, Luna Luis Ortiz, Mark S. King, Justin B. Terry-Smith, and the Southern AIDS Living Quilt. Learn more about the program by visiting www.visualaids.org. 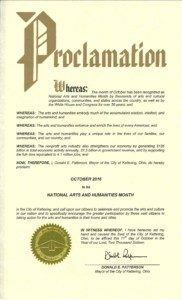 The City of Kettering recognized National Arts and Humanities Month with a Proclamation and a State of the Arts address at the October 11, 2016 meeting. Watch the video. Started as a national initiative in 1993, National Arts & Humanities Month (NAHM)recognizes the importance of culture in America. Every October, we strive to focus on the arts that take place in Kettering, encouraging individuals and organizations to participate in the arts, encourage the City to show their support of the arts and to raise public awareness about the role the arts and humanities play in our communities and our lives. Surburbanscapes: Art Beyond the Metropolis was a program initiative to commemorate the 30thanniversary of Rosewood Arts Centre and 60th anniversary of the City of Kettering. Holiday at Home Parade, 1955. From the Kettering-Moraine Museum Collection at Dayton History. 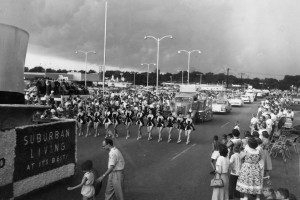 “Suburbanscapes” offered free and diverse programs that investigated the past, present and future of our city, its relationship to the region and the country. With guest artists and educators, we supported our mission of enriching the lives of our citizens through accessible, community-based arts learning programs. We organized a series of interactive artistic events, workshops and activities that dug deeper into our legacy as a suburb and a community pillar for creative expression and education. Partnering with secondary-school students, community groups, and nonprofit organizations, “Suburbanscapes” brought cultural awareness and hands-on experiences to a wide range of participants using critical thinking, artmaking and collaboration to understand our suburban environment. This series of programs addressed a strong interest in defining Kettering’s identity, appreciation and cultural value. America Recycles Day, held on November 15 and December 6, 2014, was presented in partnership with the Habitat Environmental Center and Montgomery County Environmental Services and featured activities at both the Habitat Environmental Center and Rosewood Arts Centre. The program gave participants a chance to interact with professional artists and learn to create their own sustainable artwork from recycled materials. Leesa Haapapuro of K12 Gallery guided young artists in creating an enchanted garden using throwaway items such as scrap plastic. 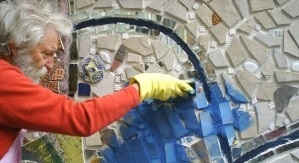 Lisa Helm of Garden Station in downtown Dayton led a collaborative effort to create a birdbath for Southdale Park using mosaic techniques. Under the direction of Mary-Michael King-Sekulic of Rosewood Arts Centre, attendees collaborated on a large-scale mural using recycled bottle caps. Kids also had the chance to take artwork home, thanks to several make-and-take stations alongside the collaborative activities. All of the activities were free to the public and offered a fresh, dynamic way for families to experience the fine arts and learn about environmental stewardship. America Recycles Day, an initiative of Operation Green Heart, was organized by the City of Kettering’s Parks, Recreation and Cultural Arts Department, and sponsored in part by Montgomery County Environmental Services, the Habitat Environmental Center and Rosewood Arts Centre. In partnership with the Dayton Metro Libraries, Rosewood Arts Centre offered a brand-new workshop on January 25, 2014. A free program, The Repurposed Library Project, introduced adult and teen students to the art of hanging book sculptures. Altered Book Arts, held on February 1 at Rosewood, expanded on the concepts of texturing, folding, adding found objects to and painting existing books. Dayton-based artist and art educator, Leesa Haapapuro, led both workshops. View more information about Uncovering Kettering! 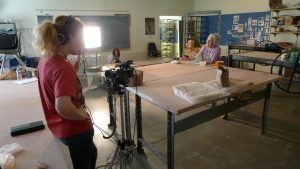 From January through May 2013, filmmaker Melissa Godoy made Kettering her studio as she embarked on a residency with high school students and the community through the Ohio Arts Council’s Artist in Residence program. Fairmont High School Interactive Media students, under the direction of Laura Hutchens, Interactive Media Instructor, captured the stories of Kettering residents through film, media, writing, and more. The films produced during this residency have gone on to receive Best Documentary awards at the 2013 Sundog Film Festival and Third Place at the Ohio Parks and Recreation Association Cultural Projects Awards. 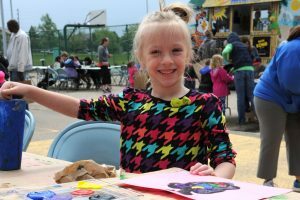 A joint effort with Kettering City Schools’ Indian Riffle Elementary, Art on the Playground was launched in 2013. The inaugural event drew crowds of over 700 art enthusiasts, who enjoyed creation stations, interactive theatre and dance performances, a paper airplane contest, raffle prizes and an Imperial visitor from the Star Wars universe. Despite rainy, windy weather, the second annual Art on the Playground on May 17, 2014 was also a big success. New for 2014 were the Kettering Arts Council’s Wishing Tree, now on display in Rosewood’s lobby, and wheel pottery demos by ceramics instructor, Steven Powers. Art on the Playground was the 2013 second place winner for Best Special Event by the Ohio Parks and Recreation Association. This event is now held annually in the spring.